STARKVILLE, Miss. (AP) — If Mississippi State’s Nick Fitzgerald is going to have a storybook ending to his college career, first-year coach Joe Moorhead has to get off to a fantastic start. The Bulldogs are a popular pick to contend for the Southeastern Conference championship after finishing with a 9-4 record last season, and a glance at the roster reveals plenty of reasons why. Fitzgerald is among the SEC’s top returning quarterbacks and he should have plenty of help from a deep roster that includes veterans like running back Aeris Williams and defensive linemen Montez Sweat and Jeffery Simmons. Now new-guy Moorhead — the former Penn State offensive coordinator who takes over for Dan Mullen — is trying to build the relationships necessary to take advantage of that talent. His rapport with Fitzgerald is at the top of the list. The 44-year-old Moorhead has developed a reputation for building high-scoring offenses. He played quarterback at Fordham and later led his alma mater to four successful seasons at the FCS level before becoming a rising star in the coaching world at Penn State, where he built a potent attack around quarterback Trace McSorley and running back Saquon Barkley. McSorley — who threw for more than 7,000 yards and 50 touchdowns over two years with Moorhead — said intelligence is a must when running an offense designed by JoeMo. Moorhead’s offense will probably look a little different with Fitzgerald, who is one of college football’s most unusual quarterbacks. The 6-foot-5, 230-pound senior has run for nearly 2,400 yards over the past two seasons while putting up decent passing numbers. But Fitzgerald’s future as an elite runner was cast into doubt at the end of last year, when he suffered a gruesome dislocated right ankle in the Egg Bowl. He spent most of the offseason recovering and says he’s now fully healthy and ready to do anything that’s needed on the field. Even so, he acknowledged his role might change this year. One of Moorhead’s former quarterbacks at Fordham, Mike Nebrich, said Moorhead’s genius lies in his ability to adapt to the talent he’s given. 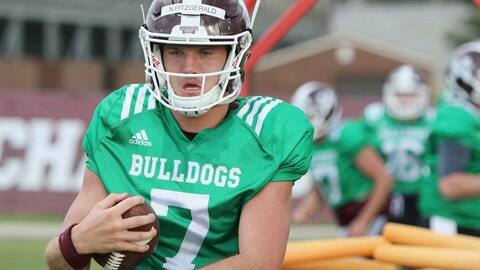 Whatever Fitzgerald can do, Moorhead will find the best way to do it. Fitzgerald and Moorhead have been able to bond over several things, including their paths from relative obscurity to the SEC. Fitzgerald was not a highly recruited prospect before landing at Mississippi State while Moorhead was pretty much unknown until his time at Penn State. Fitzgerald said Moorhead’s everyman personality is easy to like. Likewise, Moorhead appreciates Fitzgerald’s demeanor. It remains to be seen if the relationship leads to wins on the field. One reason Moorhead’s hire was met with such optimism at Mississippi State was because his offense seemed similar to Mullen’s. Fitzgerald said that after spending several months immersed in the system, that’s only partially true.